Summary: This article presents a model of how one group of teachers used inquiry to improve their understanding of student writing and revise their school’s curriculum accordingly. Specifically, they conducted action research on implementing Common Core standards in an Arizona urban charter school. 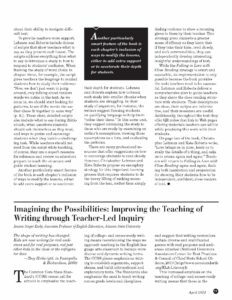 Written by and for teachers, curriculum directors and administrators, it offers a case for encouraging teacher-led inquiry groups as a way to empower teachers and improve writing instruction for students. To gain perspective on teachers’ experiences as they work to address the CCSS, I recently supported the implementation of a teacher-led action-research group for teachers at an urban charter school serving grades K–10 in Phoenix, Arizona. The seven participants each teach English language arts or writing courses and are fellows of the Central Arizona Writing Project, a local site of the National Writing Project. Our work together revolved around the following inquiry questions: How can I use writing to prepare my students for the next stages of their lives? How can I open up my curriculum to include the diverse forms of writing that take place in college, the workplace, and the community? Through our time together, this teacher-led inquiry group came to understand key strategies, resources, rewards, and obstacles for implementing college- and career-ready writing in the curriculum.